Wonderful new film by Jim Jarmusch finds great interior drama in the quiet story of one week in the life of a Peterson, New Jersey bus driver named Paterson who is played by an actor named Driver! "Paterson" (Adam Driver) is a man of fixed routines. Without ever setting an alarm clock, he gets up at the same time every morning, eases himself from the arms of his wife "Laura" (Goldhifteh Farahani), eats a bowl of cereal, and heads off to work as a municipal bus driver. At the end of the day, he returns home, has dinner with Laura (tolerating her culinary "experiments" with gentle forbearance), and then heads off with his dog Nellie for a stroll which always includes a stop at a neighborhood tavern owned by "Doc" (Barry Shabaka Henley). 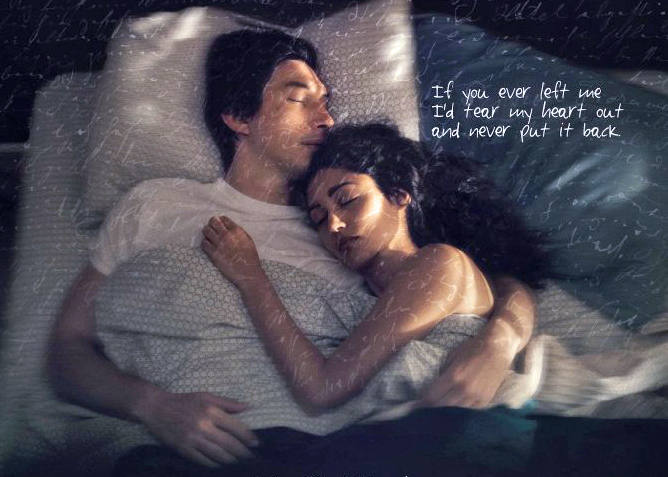 Day after day, the externals are always the same, and yet, Paterson (no first name) is fully alive in each moment, capturing the sights and sounds around him in little poems that he records at odd moments in a private notebook. Tragedy, when it finally comes, is like a thunderstorm, enormous and inevitable, and yet a totally prosaic moment that captures the essence of the everyday. Jarmusch hints at Paterson's backstory; the character like the actor has military training which seems to have left him craving nothing more from life than peace. Laura, on the other hand, gets no backstory at all, but since Jarmusch clearly wants to put us inside Paterson's head, all is forgiven. Bravo! No women filmmakers. No Jewish themes. Just a lovely little film we are both happy to recommend to you. 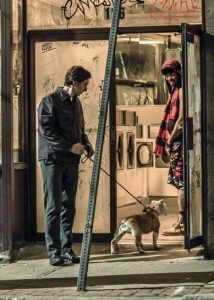 Top Photo: "Paterson" (Adam Driver) and Nellie on their nightly amble around Paterson, NJ. 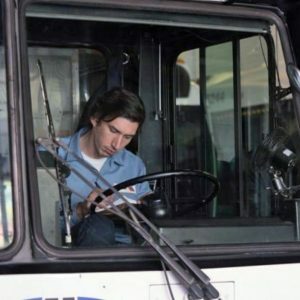 Middle Photo: Paterson writing poems in odd moments on his bus. Bottom Photo: Paterson with his wife "Laura" (Goldhifteh Farahani). The poems in Paterson were written by Ron Padgett.